This is a very easy to follow recipe that can be made and on your table in less than an hour depending on whether you serve it as a soup or as a stew over mashed potatoes. For a stew simply whisk up some corn starch with a bit of water, bring the pot contents to a boil, and stir in the corn starch mixture to thicken the broth. You can also use flour to do this, but I use cornstarch as a personal preference. This recipe has been in my family for as long as I can remember. I believe it was brought over to Canada by my grandmother who was from the other side of the pond in Paisley Scotland. When I smell this cooking I fondly remember many good times of sitting and waiting for this at my grandmother's dinner table. Fry the ground beef until it is cooked, drain, and set aside. Prepare the carrots, onion, celery, potatoes and garlic. In a 6 quart pot or Dutch oven coat the inside of the pot with oil. On medium to high heat cook the onion along with the celery. While this is cooking, boil the water to make the beef stock. Mix the boiling water with the beef stock and add it to the pot once the vegetables have cooked for five minutes. Add the Worcestershire sauce, marjoram, ground pepper, and thyme. Next add the carrots, chopped garlic, potatoes, and ground beef. Bring everything to a boil, cover and simmer for at least half an hour. About 15 minutes before you're ready to serve add the pea and or corn, and continue to cook until the frozen vegetables are cooked. This looks hearty and delicious, Susan. 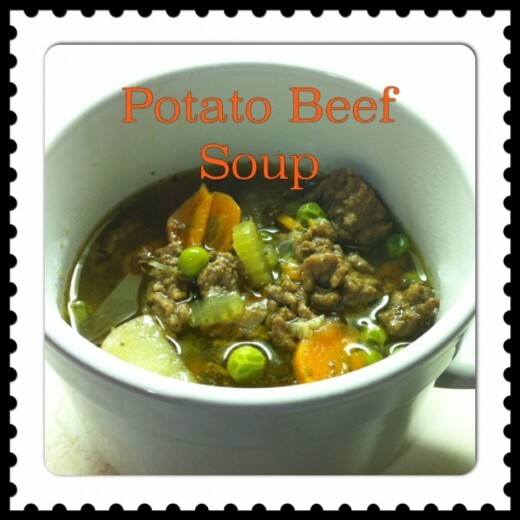 We make this using beef stew meat but it does take a couple of hours to get tender. I'll have to give the ground sirloin a try.